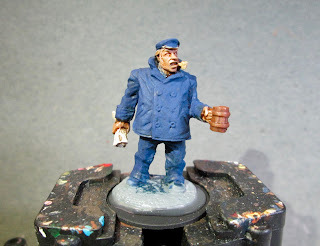 This week I picked another easy one, as the holiday season time pressure has already started to some degree, and I have a number of other painting projects I'm trying to finish up before stuff gets really crazy. 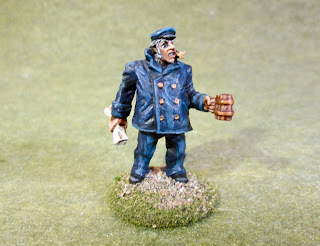 So, I did the Ships Captain, from the Bones 3 "Mythos Expansion: Part 3". I didn't buy this expansion, but picked up this figure through a trade. I began by painting his face and hands with Reaper MSP "Tanned Skin", and then painted his clothing and hat with Crafter's Acrylic "Navy Blue". I then painted the rolled up map(?) in his hand with Americana "Bleached Sand", his mug with Americana "Light Cinnamon", and his pipe with Apple Barrel "Apple Maple Syrup". (I decided it looked like a corncob pipe.) When everything was dry, I gave his face and hands a wash with Citadel "Reikland Fleshshade" wash; and when that was dry, I gave his map, mug, and pipe a wash with Citadel "Agrax Earthshade" wash.
Next, when the washes were dry, I painted his hair with Americana "Zinc", his sweater collar with Americana "Neutral Grey", and his teeth with the "Bleached Sand". 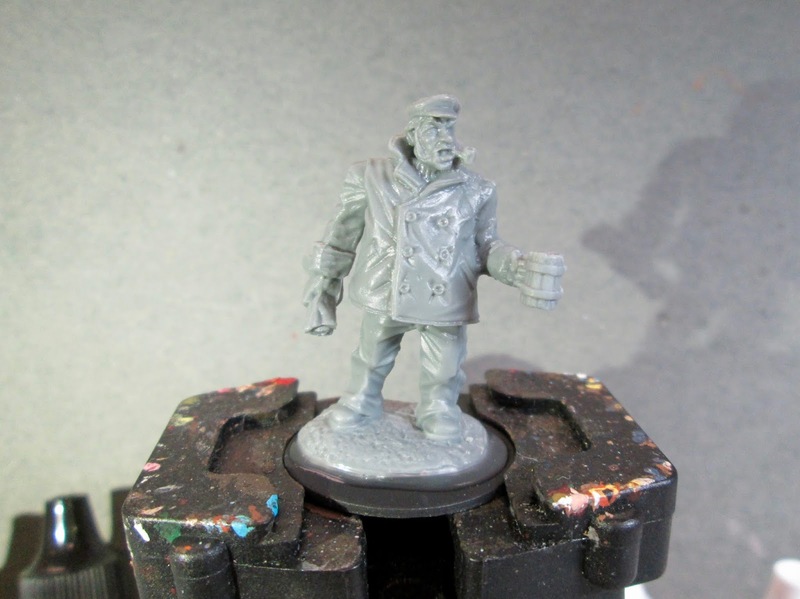 I then painted his shoes, and the brim of his hat, Ceramcoat "Black". I let everything dry awhile again, and then gave his hat, hair, and clothing a wash with Citadel "Nuln Oil" wash. When the wash was dry, I painted his eyes and highlighted his face with Raper MSP "Tanned Highlight". I then highlighted his hair with Americana "Grey Sky". Next, I highlighted his clothes and hat with Ceramcoat denim Blue", and then did the brim of his hat and shoes with the "Zinc". I then highlighted his map with Crafter's Acrylic "Light Antique White", and his mug with Americana "Sable Brown". 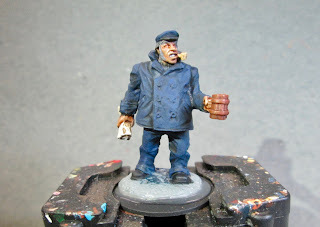 After that, I went pack and painted in the holes in the pipe and mug with the "Black", and then painted his buttons, and the bands on the mug with Ceramcoat "Bronze". Well, there he is. Nothing great, but a good tabletop-ready paint job. 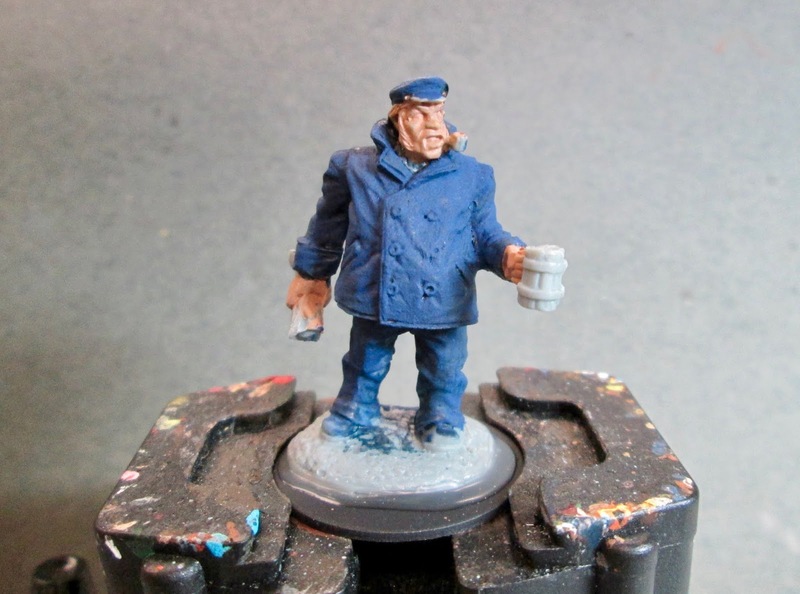 Should have given his eyes more attention, but I was in a hurry to get him done. Nice job on this guy.